The Coleman ComfortSmart Deluxe Camping Cot can give you the best camping experience. It is made in the form of a bed, thus giving you a similar experience as a person sleeping at home. This cot for camping, for example, is constructed with a spring feature that promotes your comfort when resting with its bed-like feel. The cot has enough space, hence giving you the freedom to turn as much as you want when asleep. 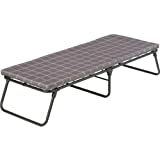 It also improves your sleeping experience when camping as it is raised above well the ground. The Coleman ComfortSmart Deluxe Camping Cot is sold with its mattress making it very comfortable for you. The mattress can also be used separately when you want to lie on the ground, which makes the camp cot one of the multiple uses. The cot bed is made from strong fabric making it durable even in the exposed conditions of a campsite. Setting up the camping cot is also very simple as it is not complicated, thus allowing you to easily set up your bed after intense camping activities. The camp cot weighs only 19.3 lbs (~8.7 kg) making it easy to transport, and when folded, it can fit in the trunk of your car. The Coleman ComfortSmart Deluxe Cot comes with a one-year limited warranty when you purchase it. It will be replaced in case of breakdown due to manufacturing defects. The Coleman ComfortSmart Deluxe Camping Cot gives you a memorable camping experience. Not only does it ensure that you sleep off the ground, it also gives you the comfort of an ordinary bed. With its thick foam mattress, it is like buying two for the price of one since you will not have to buy a sleeping pad or mattress.